Last week, the Trump Administration proposed to open up nearly all Federal waters for oil and gas drilling, reversing decades-long protection of areas in the Atlantic, Pacific and Arctic Oceans and in the eastern Gulf of Mexico. 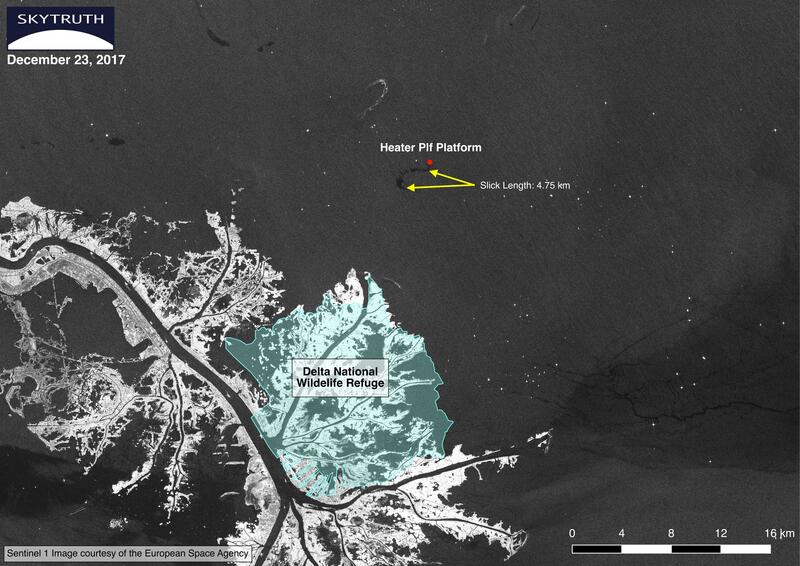 On December 23rd, the European Space Agency’s Sentinel 1 satellite collected an image of the Heater Plf platform which appears to be leaking oil in the Gulf of Mexico. 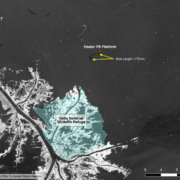 The Heater Plf is located approximately 13 kilometers north of the Delta National Wildlife Refuge in the Mississippi Delta. Based on our conservative analysis, the slick detected on this image holds at least 220 gallons of oil. Sentinel 1 radar satellite image showing small slick in the Gulf of Mexico on December 23, 2017, indicating an apparent leak or spill from an oil platform. Image courtesy of the European Space Agency (ESA). The image above reveals a small slick indicating a minor spill. But it’s the latest illustration of a much larger problem that doesn’t get much attention: the steady drumbeat of leaks and spills that accompany offshore drilling. 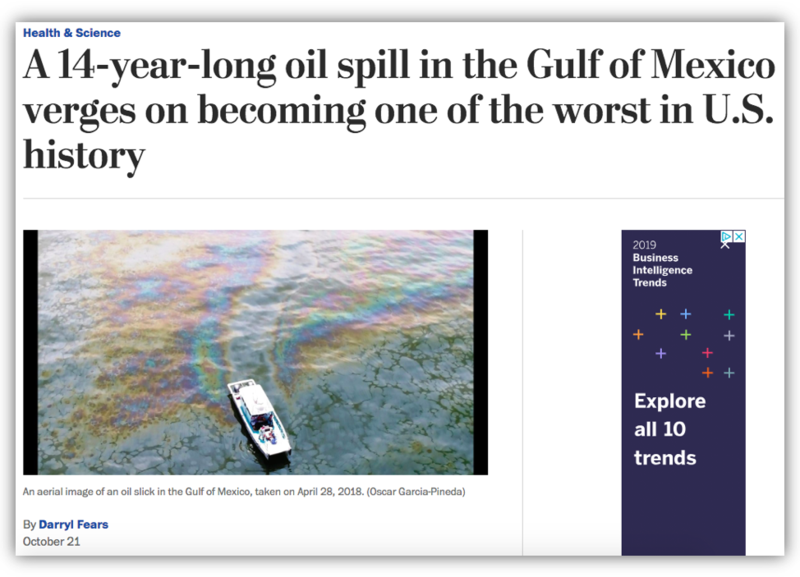 For more examples illustrating this stealthy issue, see our analysis calculating the volume of the ongoing Taylor leak, our map of 10,000 spills since the BP spill and our work with the Gulf Monitoring Consortium. This proposal to open Federal waters comes hand-in-hand with an announcement made last week, in which the Administration proposed reducing safety regulations on oil and gas drilling in the outer continental shelf. Currently, only the coastal waters of Texas, Louisiana, Mississippi, and Alabama in the Gulf of Mexico can be leased for drilling. These proposed reductions nullify safety rules which were put in place after the fatal and costly BP / Deepwater Horizon disaster of 2010. The Heater Plf platform is owned by New Century Exploration LLC, and according to information provided by the Bureau of Ocean Energy Management (BOEM) the platform is no longer producing oil but has not been removed. In this 2014 legal brief, New Century and Champion Exploration LLC state that the new requirements under the Outer Continental Shelf Lands Act made it “infeasible” for them to prove their financial capability to handle oil spill preparedness. After the Deepwater Horizon spill, drilling companies were required to estimate the cost to clean up a “worst-case” scenario. New Century could not demonstrate they had the $1.8 billion required to clean up a worst-case spill, so they ceased activity at this site. With the administration pushing to open new areas to drilling, it seems reckless to be walking back the safety rules put in place to help prevent the next catastrophic oil spill. More than seven years later, the Gulf is still feeling the effects of the largest accidental oil spill in history, while the drilling industry argues these regulations are burdensome to stakeholders and unnecessary. Can we afford to relax our safety standards regarding oil and gas drilling? Can the Gulf of Mexico survive another worst-case scenario like the Deepwater Horizon spill? Can we risk these disasters in the Gulf and elsewhere? Do we want the onus of recovery from these incidents to be shouldered by the taxpayers? It’s an essential part of our democracy to voice your opinion about decisions that jeopardize public safety and the health of our public lands and waters. Submit your comment on the proposed rollback of the offshore drilling safety rules to the Federal Register by January 29, 2018. With President Trump preparing to open the Atlantic coastline to offshore drilling, we thought it would be a good time to revisit the cautionary tale of Site 23051 — Taylor Energy’s 13-year old continuous oil leak in the Gulf of Mexico. The estimated cumulative volume of crude oil spilled into the Gulf of Mexico from this chronic leak over the period 2004 – 2017 now stands between 855,421 and 3,991,963 gallons. 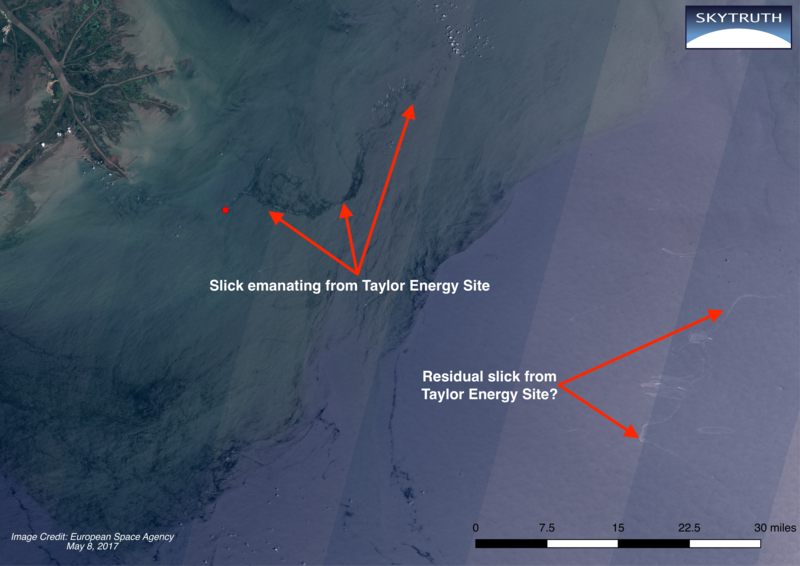 The Taylor Energy site perfectly captures the dysfunction of offshore oil development: In 2004, an underwater mudslide caused by Hurricane Ivan toppled one of the company’s platforms and buried the damaged wells attached to it on the seafloor. Reports of oil on the surface at the site of the wreckage followed shortly after and a secretive clean-up effort ensued. In 2008, after several failed attempts to stop the leaks and Taylor Energy’s decision to sell off all of its income-generating oil and gas assets in the Gulf, federal regulators ordered the company to post a $666.3 million security bond to ensure there was enough money to plug the wells and clean up remaining pollution. In 2010 and 2011, Taylor Energy used a leased drill rig called the Ocean Saratoga to slowly find and plug some of the damaged wells (only 9 of the 25 wells at the site have been plugged). Additionally, three underwater containment domes and an underwater collection and containment system were put in place at the wellhead area to try and capture any remaining oil. Taylor Energy’s next step was to sue the government to try and recover more than $400 million from the trust they had set up previously. The lawsuit is in limbo amid negotiations over the company’s remaining responsibility and the feasibility of further clean-up. Documents filed by the Justice Department on December 15th revealed new evidence of two plumes of oil and gas resulting in an “ongoing oil release,” bringing some renewed hope Taylor Energy will be held accountable for its mess. 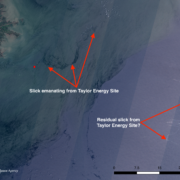 SkyTruth became aware of the chronic leak from the Taylor Energy site in 2010 while analyzing satellite imagery of the BP / Deepwater Horizon disaster. We’ve reported on slicks coming from the Taylor Energy site dozens of times in the years since, and in 2012 we released a cumulative spill report estimating that between 300,000 and 1.4 million gallons of oil had leaked from the site since 2004. But with offshore drilling in the Atlantic looming once again, we thought now would be a good time to revisit those calculations and reconsider the risks that offshore drilling poses for coastal communities. Our 2017 update uses the same methods outlined in our 2012 cumulative spill report. Our update analyzes the information contained in 2,719 public pollution reports filed with the National Response Center. Most reports were likely filed by Taylor Energy or their contractors covering 2,275 out of 4,852 days (just 47%) from the first report of oil at the site on September 17, 2004, through December 12, 2017. We computed an ‘estimated average daily slick extent,’ and from that, we derived an ‘estimated average daily flow rate’ for each calendar year since the spill began. Multiply the daily flow rate by the number of days the site has been leaking, and you have a rough estimate of the cumulative volume of the spill. For more on the methods, see our original report. The data and analysis are accessible here. the average rate of degradation of an oil slick expressed as a half-life. For average thickness, we used our conservative standard of 1 micron (1 millionth of a meter); we also computed everything using an even more conservative estimate of 0.5 microns to reflect the possibility that this slick is thinner than most. For degradation half-life, we assumed that one half of a given amount of a thin slick of oil on the surface of the ocean would degrade in 3-7 days. We believe this range is a very conservative assumption because the longer the assumed lifetime of oil on the surface of the water, the lower the implied daily flow rate will be. There is another potentially troubling trend in the data: since 2015, the average daily reported sheen extent has been significantly larger than in the past, while the number of pollution reports submitted to the NRC has come down. On the one hand, these numbers could be the result of more diligent and accurate measurements made during routine monitoring and overflights, spurred in part by the public scrutiny this chronic leak has come under due to the work of SkyTruth and our partners in the Gulf Monitoring Consortium. 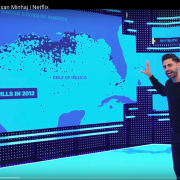 On the other hand, they could be the result of some qualitative change on the seafloor, in the damaged wells, or in the subsea reservoir that is allowing larger amounts of oil to leak out into the Gulf. The slight decrease in average reported sheen size over the past three years is somewhat encouraging: if the significant jump in 2015 was indeed due to more accurate reporting by Taylor Energy, then this recent downward trend could indicate the leaks are finally slowing. But we are hampered by our dependence on observations and reports submitted by the responsible party, Taylor Energy. These reports have been proven inaccurate, systematically underestimating the size of the slick by more than an order of magnitude compared with independent measurements based on direct observation of the slick on satellite imagery. Direct, regular measurement and observation of the leak by a neutral party is crucial to understanding what is happening and predicting the likely future at this site. For this reason, we will continue our monitoring work. More Offshore Drilling to Come? Once again, the federal government is proposing that we expand offshore drilling to new areas in US waters. Today, President Trump signed an executive order directing the Department of the Interior, which manages our public lands and waters, to review the Obama administration rule that deferred oil and gas leasing along the Atlantic coast and in the Arctic Ocean off Alaska. People who could be affected by new drilling in those areas should consider that it’s not just the risk of the occasional major disaster they would be facing; it’s the chronic, day-to-day pollution accompanying offshore oil development that is systematically under-reported by industry and the government, the “death by 1,000 cuts” that is so easy to ignore. 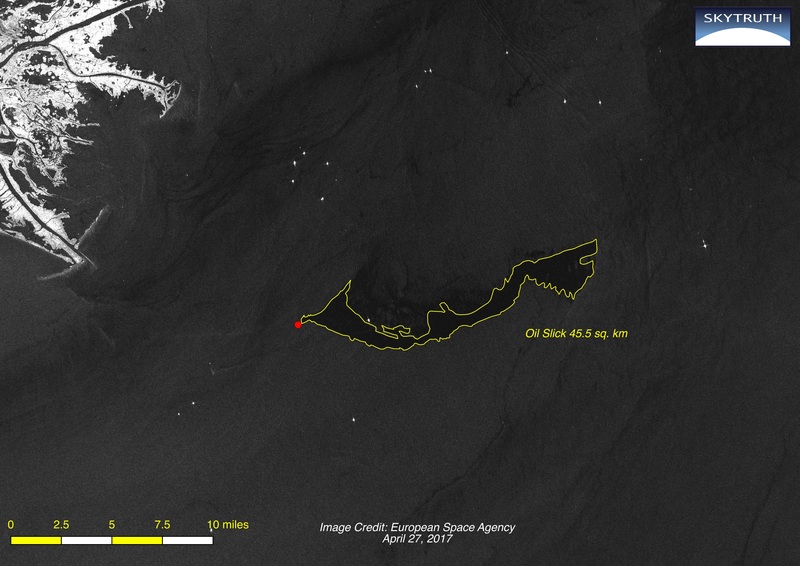 Sentinel-1 radar satellite image showing oil slick caused by a chronic leak of oil from the seafloor at the Taylor Energy site, where an oil platform was destroyed by a hurricane in 2004. Image acquired 4/27/2017 at about 7pm local time. This Sentinel-1 image taken on April 27, 2017 shows an oil slick covering an area of 45.5 square kilometers (km2). Our calculations assume that oil slicks observable on satellite imagery have an average thickness of at least 1 micron (one millionth of a meter), so each km2 contains at least 264 gallons of oil. Multiply that by the area of 45.5 km2 and the Taylor slick shown in this image contains at least 12,012 gallons of oil. 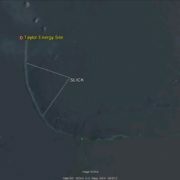 This site has been leaking oil continuously into the Gulf since Hurricane Ivan came through and knocked over the Taylor Energy oil platform in September. That’s September, 2004. You can review the history of this site and see the hundreds of spill reports received and tracked on our Taylor Chronology page here. Until something is done to stop this leak, we’ll continue to monitor the site and keep you informed. /wp-content/uploads/2016/08/test_logo.png 0 0 Teri Biebel /wp-content/uploads/2016/08/test_logo.png Teri Biebel2017-04-28 18:35:512018-12-24 15:11:38More Offshore Drilling to Come?